by Dave from The Longest Way Home ~ January 29th, 2013. Updated on June 2nd, 2018. 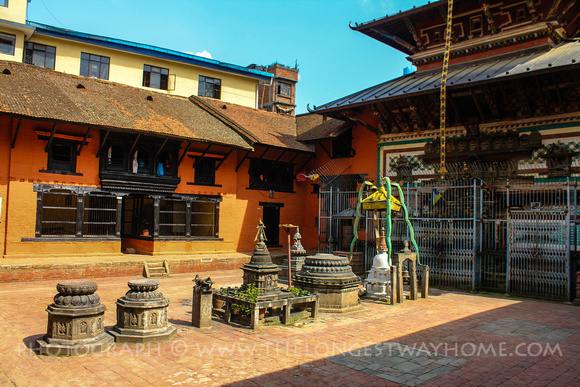 Published in: Travel blog » Nepal. In an ancient courtyard walls of stone carved deities, ferocious looking lion guardians and all manner of unknown sculpted faces all stared down at me. As much as I wanted to inspect them up close I was also aware that in this empty square there were probably other more human eyes watching me. I walked to the only visible open doorway that led into a dark seated area and further into another open area at the other side. Yet the most unusual of items above the doorway told me there must be people here. Moreover there was a small hand painted sign which read: “living goddess ->” . How to say you are looking for a living goddess? The doorbell made no sound as I pressed it. A not too uncommon event in Nepal. I stepped back and turned around to face the courtyard in case I’d missed another entrance way. The pitter-patter of footsteps on wood made me turn back. A shadow revealed a secret. Then, above the doorway a woman’s round face appeared on a balcony. She was smiling in a warm motherly way that instantly made me think she was a good person. She gave me a half-head wobble of curiosity and greeting that told me to speak. Shoes removed downstairs I made my way up a narrow wooden staircase led by a youngster in his teens to a thinly carpeted room void of all furniture. There was a middle-aged man who greeted me and an older man sitting cross-legged by a pale blue wall who nodded politely. I sat by the sole wood framed window overlooking the courtyard outside. Beside me was another staircase leading upwards and to my other side a single thick red curtain. An exchange of formalities over with I asked some simple questions about the Kumari. Apparently she was being prepared and would be ready soon. No matter my extended length of time in Nepal it’s always these long awkward yet smiling silences that make me want to speak better Nepali or Newari. But even then small talk in such situations never seems appropriate. At least for me. The kind woman appeared from behind the single red curtain and greeted me once again with that warm smile. I couldn’t help but ask who she and the others were. I was slightly shocked and taken back as my thoughts were that the Kumari did not live with her family. “She is ready,” said the mother before I could ask anything else and just as my curiosity peaked. She sat eyes staring straight ahead at a point on the wall opposite her. Dressed in red robes with ever so pale skin she looked no older than eight. Her brother urged me to sit on the floor opposite the Kumari. 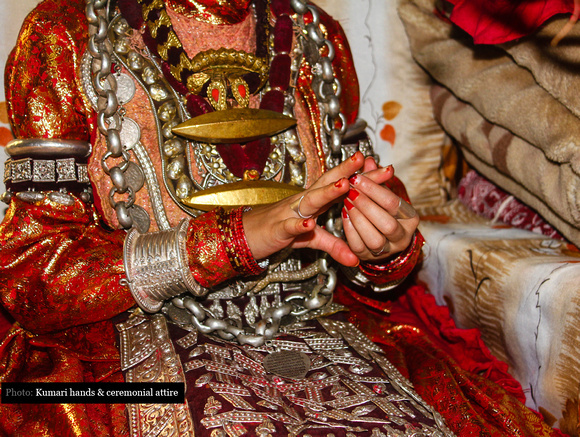 I moved across the room in two strides and knelt down before the throne looking up at the Kumari. All around her were small dishes holding offerings of rice, inks, powders and other paraphernalia. Her eyes by now had moved to stare at the ground before both of us. The Kumari’s brother suggested I should receive my blessing now. Rather strangely at this time I did not want one. 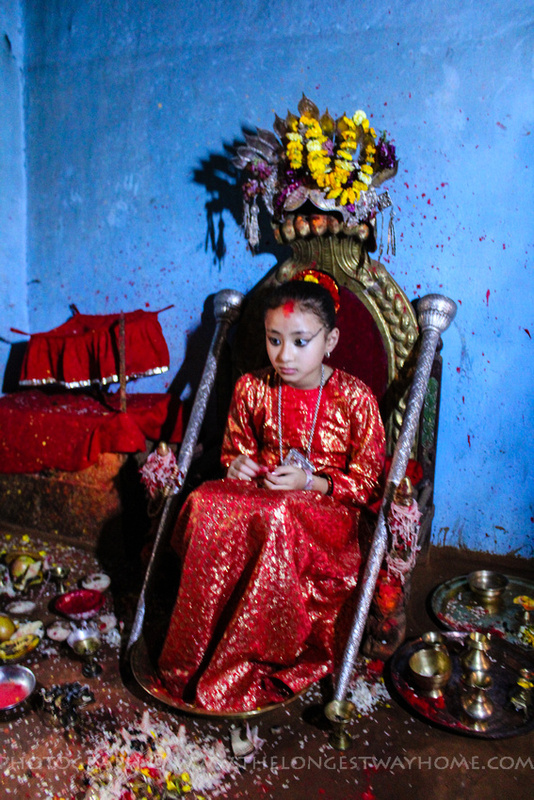 I felt like I was violating a Newari / Nepali tradition by asking for something I did not believe in. Cultural custom dictated that I should get a blessing anyway. But after so many years of travel one becomes conflicted with so many customs that I, for one, stick with my own. Instead I simply asked if I could just take a photograph? Little did I know but I was descending into a personal struggle that would soon lead me to a new revelation. The brother nodded and spoke in Newari to the Kumari. The Kumari’s eyes moved from where they were to a different point in the room and back again almost as if she felt awkward. It was at this point that my heart yelped. I no longer saw a living goddess. I saw a little girl who had just become an object. Before her a man who was about to fracture his condition and accept a tradition. My camera raised I now felt like a betrayer of innocence, culture and my own quest. A man exploiting a little girl for a photograph. My hands shook and I clicked away. How far and how many photographs could I take? I’ve taken photographs of street children, dead people, violence, beauty, love and all the spectrums in between. Nothing had effected me. Until now. This girl who is a goddess is a controversial figure in many respects. So be it. But to me right then, she was just a young girl who I’d surely made uncomfortable. Let alone the fact I’d probably offended her, the goddess and a culture by not wanting a blessing. The room was so dark none of the photographs would be exceptional anyway. I continued on though. Doing what I do. I asked if the brother could tell the Kumari to look at the camera. I felt cold and heartless. She was not a little girl. She was a tourist attraction. A living object I could order around. With every shutter click the Kumari would never look directly at the camera lens. I’d seen this before in West Africa and rural places around the world. She was uncomfortable with this. Uncomfortable with a stranger in this her inner sanctum who had no interest in her beliefs other than to take a photograph. Of course later I’d discover why she was really avoiding camera lens. And, perhaps I am grateful. I could do no more as something was collapsing within me. I thanked the Kumari and left the room with no blessing. Outside in the bright pale room I was offered tea by the Kumari’s parents. I took it upon myself to redeem what had occurred inside. No longer thinking of the goddess I asked the question I now wanted to know most. From Living goddess to a girl called Samita. Since this story was first published many from the media have tried to copy it. Sadly, as they try to rewrite it, they leave out many essential parts about the Kumari. 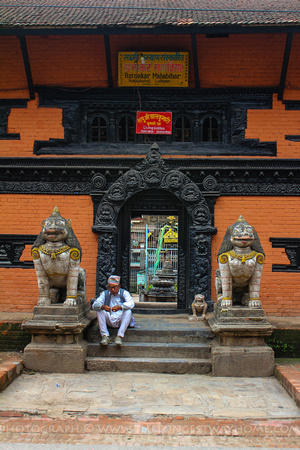 Further, several Nepali travel agents try to sell tours to see the Kumari. Please do not partake in these tours no matter how “community” focused these companies say the are. They are simply cheating the Kumari families by only offering token payments. As a tourist, you do not need a tour to visit a Kumari. 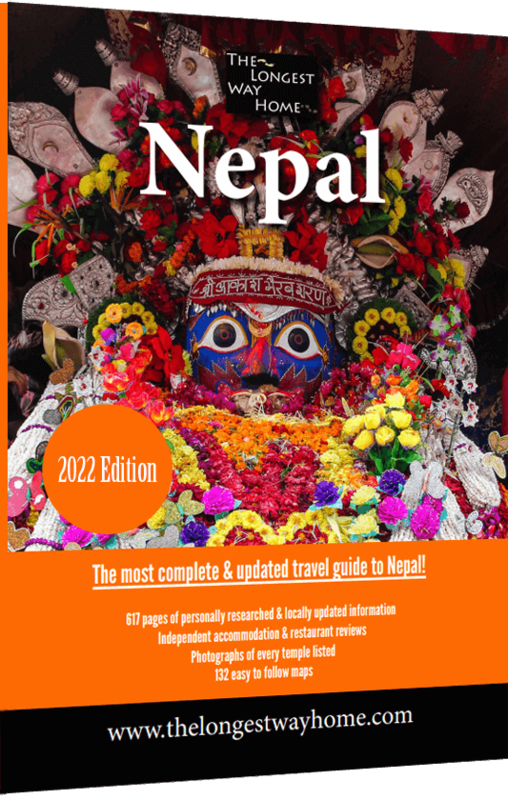 Read on to find out how – or download my guidebook to Nepal for full details. Captivating, I can say no more other than to say this has me hooked once again. You book the glossy mags on the top shelf to shame. Namaste :) Hi Dave, have heard about the Kumari but it remains mysterious for me as ever. Your articles are real eye opener. It not just on introduction but includes an up close and personal interview. Very interesting read indeed. Maybe I should just wait until the next chapter but did you manage to ‘chat’ with the Kumari or you are prohibited from doing so? Did you see any special features about her that you don’t find on other ordinary children after getting to know her? Thanks for the kind words. I’ll let you see yourself when the final part is published! Have to keep you on your toes! Not sure if you’ve see it but here’s a sort of Kumari FAQ page (not finished) which might answer some of your questions. But yes, the Hindu religion has quite an aura about it. And it’s really, really difficult to follow with all the legends and myths etc. The Kumari is just a living part of that. I’m not sure for how much longer though as some people want it to stop. Heartbreaking. I would have been massively conflicted too. I’m not sure I could have taken the photos, certainly not without the same discomfort you felt. Unless children are happy and/or I know them personally, it’s always difficult to take pictures of kids and post them without feeling like you are using them somehow. I look forward to reading about what happened next. The Kumari and the lifestyle involved is controversial. There’s been a lot of press/human rights involvement over the years and a lot has changed. The sheer blood letting at the induction challenges has been toned down and education has been granted. I’ll stay impartial on this one for now. This actually made me a bit sad. I think it’s hard for us, non-believers, to understand how it is possible to objectisize a child like that. What about parents dragging their childres to beauty pageants and stuff like that. I know it’s not quite the same, but still it made me think of that. Very good reference Sofie. Have you seen “Little Miss Sunshine”? I’ve seen people’s reactions from outside of the USA when they see those beauty pageants for children and they are shocked at what the children go through. Well, it did take a few years! One of the few “blogs” that goes beyond blogging. You have the essence of a multiple storyline captured. Like everyone else I’m looking forward to the conclusion of this one! Thank you Emma, glad you’re enjoying reading this. Thank you, hope you enjoy the conclusion too! Just wanted to say that I’ve been enjoying this wholeheartedly! Incredible subject matter. Thanks Anna, nice to hear from you! It’s been interesting at this side of things too. great one..this just catches my eyes and my curiosity at the same time..it made me become more interested about the Kumari.